Take your presenatation mobile and tilt your screen to use it as an interactive table. This mobile stand features a height adjustable lift with a fully adjustable 500mm stroke with a total load capacity of 125kg. The Lift also has a tilt function allowing the screen to be rotated 90 degress and used as an interactive desk. 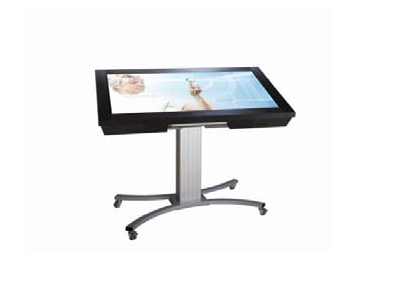 The trolley is suitable for all ctouch interactive screens from 46 " up to 70". The interactive screen lift trolley comes in white aluminium and is the perfect addition to any interactive touch screen. This lift is extremely usefull in classroom scenarios not only making the unit mobile but also making it easy for small children to reach the screen.